Simple Summer Lunch | "Il faut goûter"
It’s raining, the garden’s growing, and giant green zucchini keep appearing on my kitchen counter (Dad must be out early scouting the ready ones). Yesterday I turned one into the star of a light summer lunch; I think zucchini are great sautéed, and since they don’t have a strong flavor on their own, you can season them just about any way you love. Mexican and Tex-Mex flavors have always been a favorite and a go-to for me in the kitchen, so I dressed my Zucchini-Corn Salad Sauté with one of my favorite dressings I’ve recently come up with, a Spicy Southwest Cilantro-Lime Dressing . 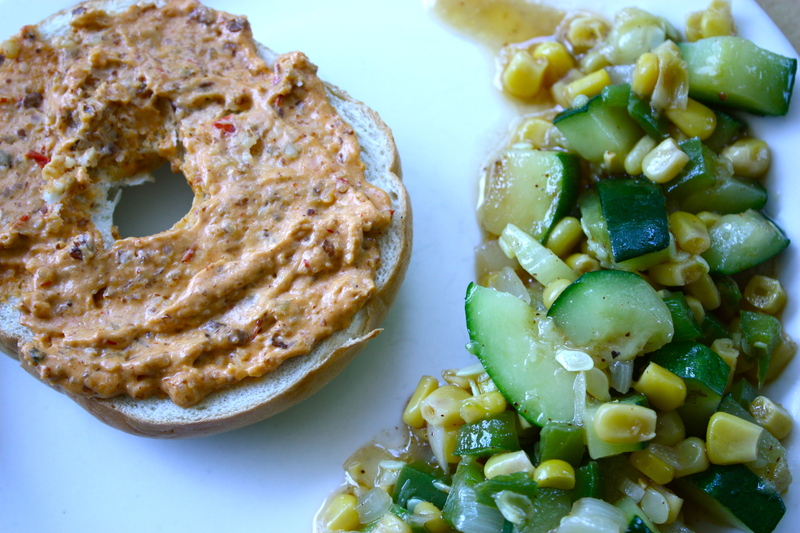 Had some bagels in the fridge, so I whipped up some spicy Chipotle-Almond Cream Cheese as a topper. Plated, the two made a nice little lunch! The zucchini salad would make a nice summery side for grilled meats as well. Sauté the vegetables in about 1 tbsp of vegetable oil on medium-high heat until everything is tender (10-15 minutes). With a slotted spoon, spoon the vegetables into a bowl, leaving the excess liquid in the pan (a lot of liquid cooks out of zucchini). Pour Spicy Southwest Cilantro-Lime Dressing (below) over the vegetables and serve warm. Grind all ingredients together in a food processor until smooth. 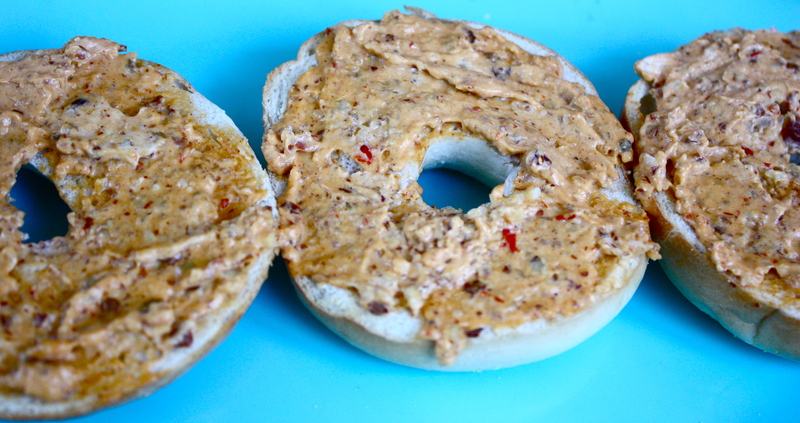 Slather on toasted bagels, or use as a sandwich spread! This entry was posted in Uncategorized and tagged chipotle cream cheese, southwest dressing, zucchini, zucchini sauté by needtotaste. Bookmark the permalink.